The Renault Master and Renault Traffic (PF6) manual gearboxes (5-speed and 6-speed) are known for wearing out all their bearings – not just one or two. Worn bearings are not the end of the world but when ignored and driven into the ground, the bearings can collapse and the cost of repairs can rise depending on the extent of damage. 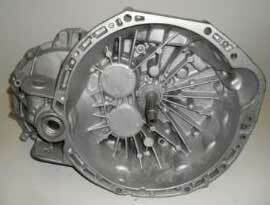 We can repair your gearbox by replacing damaged components or offer a fully rebuilt gearbox. All reconditioned gearboxes come with our 2 year unlimited mileage warranty + free fitting at our gearbox service centre. A new replacement gearbox will cost you upwards of £1300.00 +Vat (excludes fitting) and will come with a limited 12 month warranty. Second-hand (used) gearboxes are generally a lot cheaper but also come with a limited 30-90 days warranty. You can never be sure of the history when purchasing used second-hand parts. It may have been removed from a front-accident damaged vehicle or a high-mileage vehicle which can reduce the life expectancy of the part. We offer a fast, efficient and affordable Gearbox Repair + Rebuild service. We’re able to fully strip & rebuild the Renault Master and Renault Traffic (PF6) manual gearboxes (both 5-speed and 6-speed). We use new genuine OEM components when rebuilding these gearboxes to ensure that each & every repaired gearbox meets and exceeds OE specifications. All of our reconditioned gearboxes come with a 2 Year unlimited mileage warranty and Free fitting at our gearbox service centre. If you’re experiencing gearbox faults with your Renault Traffic / Renault Master, call us today on 0844 847 9999. Tags : Reconditioned PF6 Gearboxes, Renault Master / Traffic Gearbox Problems, Renault Master Gearbox Repairs, Renault Traffic Gearbox Rebuilds. We have sent an email with full pricing and information. We can certainly rebuild this gearbox for you. I’ve sent you an email just now with full pricing and information. Hi, I have a 2007 Renault trafic 2.0 115 that drives fine in all gears but has a wine in 5th & 6th, can you give me a price to recon. A common issue, we’ve sent you an email with pricing and information. We’ve sent you an email with full pricing and information for the gearbox rebuild on your Renault Master. Thanks for the enquiry and many apologies for the delay in getting back to you. I’ve sent you an email now with full pricing and information regarding our repair options. Please do not hesitate to reply to our email if you require any further assistance. I need a quote for my gearbox. Is six speed. Reg plate is OU59WRK.